The 425 is the flagship model having been designed for the most common new construction dryer exhaust configuration. 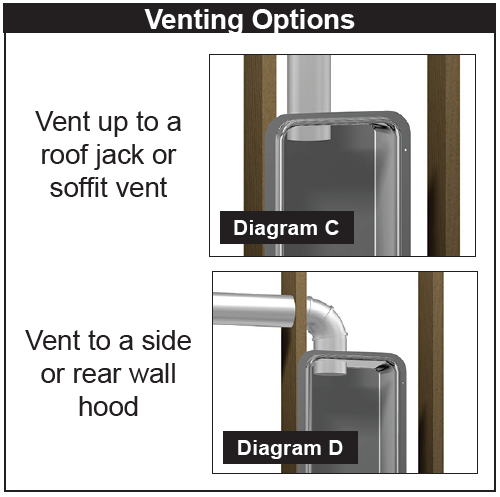 While there are a few exceptions, it is primarily used for venting upward in 2 X 6 walls. 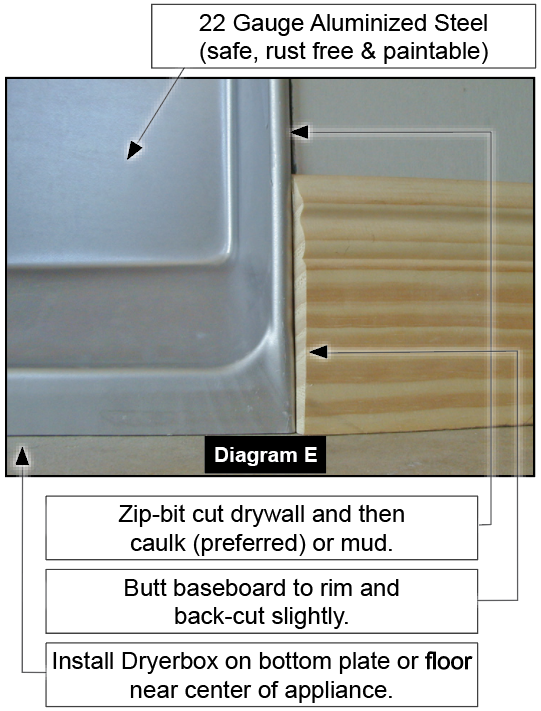 Where wall depth is restricted, it can be installed in a 2 X 4 wall with a 1" furring strip. The only time the 425 should be rotated is to support pedestal or stacked units for downward venting. This model was designed to allow room for other mechanical components in the cell of the wall. It is narrow enough to share plumbing or electrical runs. To provide dryer-type flexibility (in the event that someone wishes to change from a pedestal dryer, for instance, to a floor standing dryer), select the new Model 480 for a standard installation. Diagram A For 2x4 walls, add a single furring strip to each stud or use the 3 ½" deep Dryerbox Rest Dryerbox on bottom plate or on the floor. Install as low and as near to the center of the expected dryer location as possible. A)—not applicable if stackable unit or on a pedestal. Attach Dryerbox® to stud and bottom plate at a minimum of 3 corners. floor standing dryers venting down, the Model 4D or 3D are recommended. the back-side of the box to minimize condensation and temperature transfer. 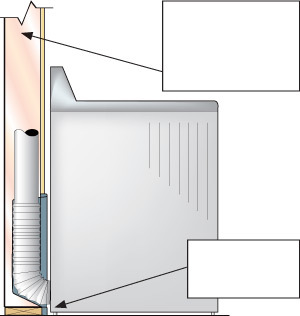 the Dryerbox cavity. Visit www.dryerbox.com/firestop for more detail. port can be enlarged or relocated easily with a step bit. supported in-place. 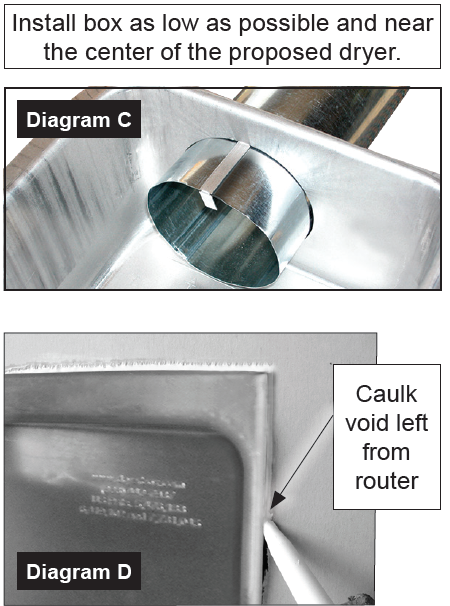 Seal penetration with foil tape or sealant caulk. with two elbows. Use the Model 4D or 3D to go down. (Diagram E). It is best to caulk or mud this void (required for One-Hour Rating). either side of box (Diagram E). (alkyd) paint when the rest of the wall, trim or baseboard is painted. 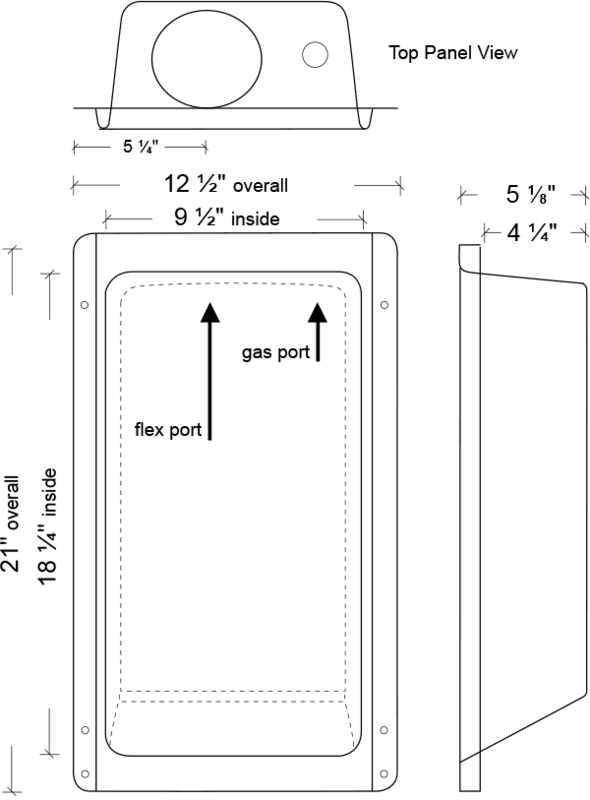 When installing The Dryerbox in a 2x6 wall, the model 425 is an excellent choice! This sleek model is narrow enough to allow room for plumbing and electrical to run alongside. Even within a 2x4 wall, it can be installed with a 1 inch furring strip. Designed to be used for upward venting, it can also be rotated to support pedestal or stacked units to accommodate downward venting. 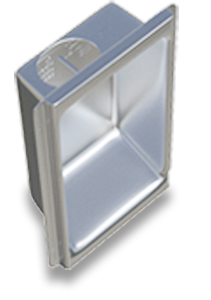 The Dryerbox model 425 is made of 22 gauge aluminized steel, weighing 4.14 pounds. The distance from the nailing flange to the rear of box is 4 1/4", and the overall measurements are 21" h x 12 1/2" w x 5 1/8" deep. The inside measures 9 1/2" wide x 18 1/4" tall.